Radio has always played an important part in my life. I can’t remember not having listened to the radio – even for a single day – since I was a child. The first thing I do every morning is switch on the radio. I love how presenters effortlessly take the listeners from one track to another and how each of them determines the style and feel of the show. 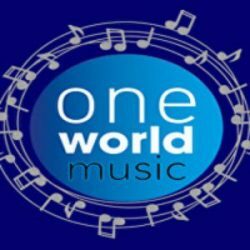 Being a presenter at One World Music Radio is a dream come true. My music show is called “Kaleidoscope”, which literally means “to see beauty”. It’s a theme-based show in which I bring a broad variety of new age music ranging from piano solo to neo-classical. My goal is to introduce many good new age artists to the audience. In “Musings With …”, I conduct interviews with artists and musicians who have left their mark in the New Age music industry. Click the image on the left to listen to my shows. Over the years, I have interviewed renowned new age artists for radiostations around the world, including Terry Oldfield, Erik Wøllo, Rodrigo Rodriguez and many more. I aspire to help guide the artists to express in their own words what will connect the essence of their music with the listeners. Our conversations are engaging and exploratory in a way which often leads to objective insights into their own artwork. **NEW** – 2018 Christmas Interview with the First Lady of Celtic Music, MOYA BRENNAN! 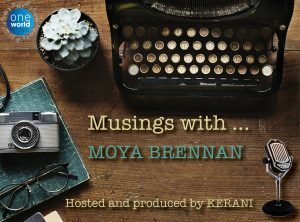 Click on the image on the left to listen to my interview with Moya Brennan (Clannad). Please click on the purple logo to the left to enjoy the following interviews and podcasts on Anchor.fm. Radio has always played an important part in my life. I can’t remember not having listened to the radio – even for a single day – since I was a child. The first thing I do every morning is switch on the radio. I love how presenters effortlessly take the listeners from one track to another and how each of them determines the style and feel of the show. Click here to listen to my shows. Over the years, I have interviewed renowned new age artists for radiostations around the world, including Terry Oldfield, Rodrigo Rodriguez, Erik Wøllo and many more. I aspire to help guide the artists to express in their own words what will connect the essence of their music with the listeners. Our conversations are engaging and exploratory in a way which often leads to objective insights into their own artwork. Please click the purple logo to enjoy the following interviews and podcasts on Anchor.fm.